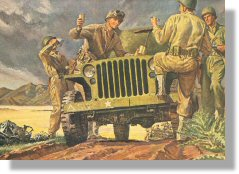 How Many Days Did It Take To Design The Jeep? How many days do you think it would it take to design it today? P.S.- If you thought that your auto customers are tough about stealing co-opting uh- ‘sharing’ your PPAP submitted process information with your competitors, this story will tell you who taught them that- the US Government! This entry was posted on Friday, November 18th, 2011 at 9:14 am and is filed under Break Room, Engineering. You can follow any responses to this entry through the RSS 2.0 feed. You can leave a response, or trackback from your own site.